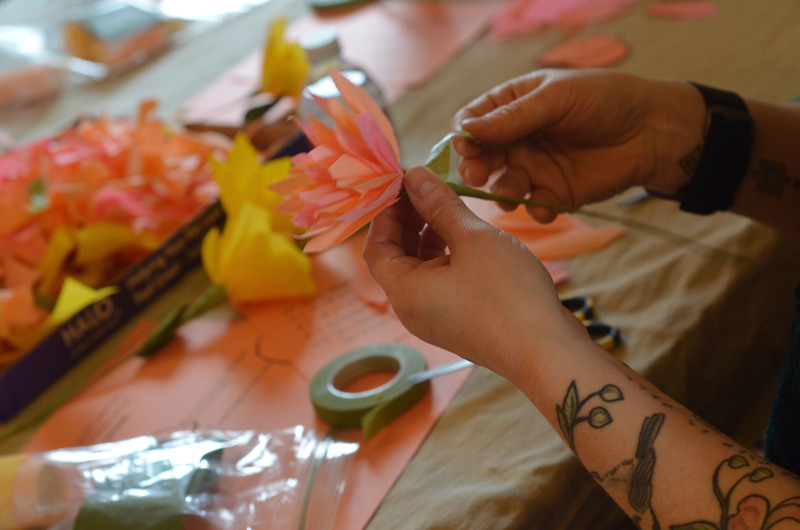 Taking inspiration from the Botanicals of the Museum of Glass exhibition Joey Kirkpatrick and Flora C. Mace: Every Soil Bears Not Everything, join us for an afternoon of paper flower making on Saturday, May 7! It’s a fun and gratifying craft, and from such simple materials – just paper, tape, and wire – you can create the most beautiful blooms. 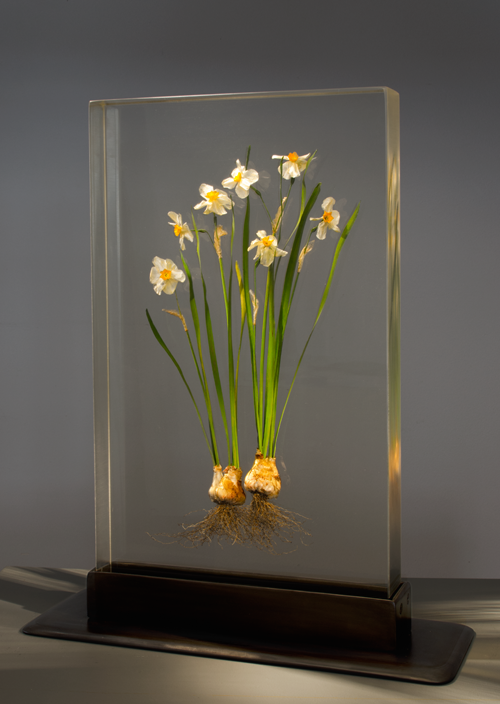 Joey Kirkpatrick (American, born 1952) and Flora C. Mace (American, born 1949); Field Daffodils, 2015; Flower, composite, glass, paint, and steel; 26 1/2 x 22 x 8 inches; Photo courtesy of the artists. I’ll be at the workshop, so I hope to meet you! I’m looking forward to making some paper bouquets for both me AND my mom in Pennsylvania. Let’s hope the flowers survive the plane ride! During the session, you’ll learn how to create several styles of crepe paper flowers and foliages using traditional crepe, duplex (double-sided) crepe, and European crepe paper. You’ll leave with some knowledge and a lovely paper bouquet in hand! Photo courtesy of Laurie Cinotto. Laurie Cinotto, who will lead the workshop, is a local crafter and DIY project designer. 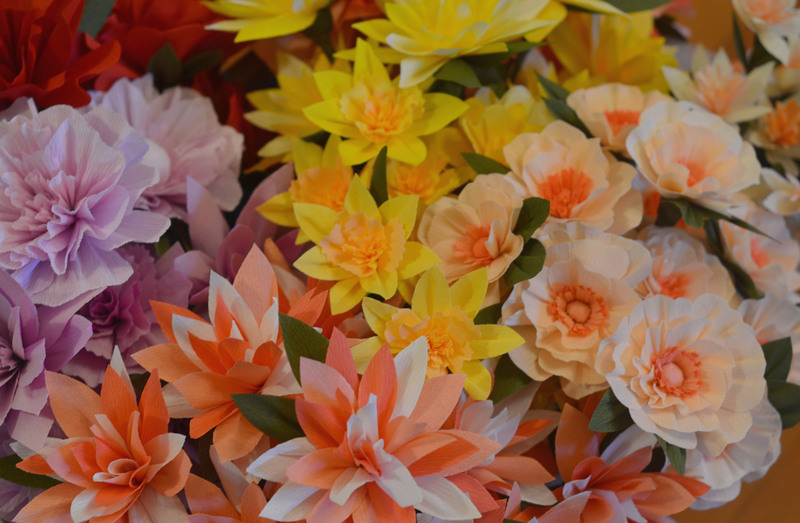 She crafts all sorts of things out of paper, like birdcages, notebooks, lanterns, and ornaments, but her area of expertise is paper flower making. You can find out about all the things she makes on her craft blog, LaLaLaurie.com. 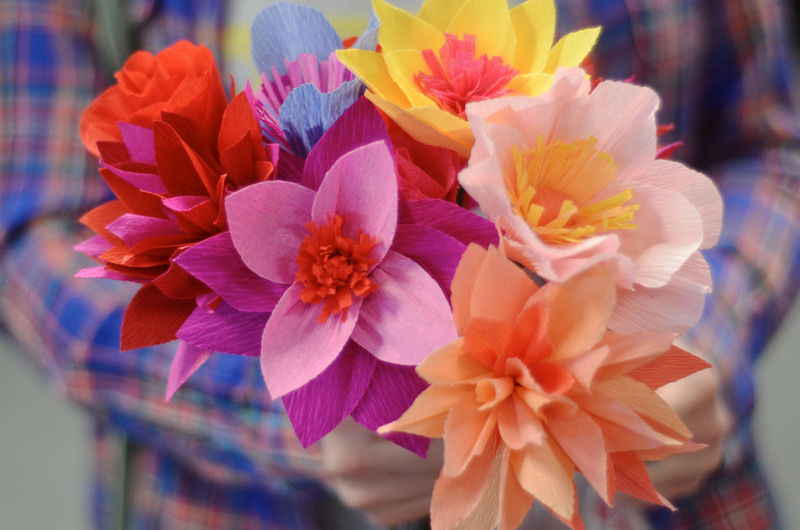 Laurie’s paper flower making workshop is a great hands-on activity to do with your mom ahead of Mother’s Day or to create a surprise bouquet for your mother on May 8! Workshop details, including time and cost, are available on the Museum’s calendar. Hope to see you on May 7! This entry was posted in Events, Hands-on, Museums and tagged cats, Crafts, DIY, Hands-on, Itty Bitty Kitty Committee, Laurie Cinotto, Museum of Glass, paper flower making, paper flowers, Tacoma on April 29, 2016 by Museum of Glass. As my time comes to a close at Museum of Glass (only two more days, but who’s counting? ), I have been taking some time to reflect on the past two years here working in the visitor services department. The journey has been exactly that, a journey with peaks and valleys. But who wants to talk about valleys, low points, the dark ages? Yeah, neither do I! So I made a list. Yes, the plain old top-something list. These are the top three moments for me working here at Museum of Glass. Ready? Set? GO!! Once I leave the Museum, I plan on every once in a while coming back to check out a new exhibition, see one of my favorite artists in the Hot Shop, or just to simply say hello to old co-workers. However, there will be a day in March every year that you can count on me being at the Museum, and that will be the day of the annual Slider Cook-Off, which has to be one of the coolest, most exciting events in town. Slider Cook-Off participant WildFin won the 2016 Grand Prize with their slider. This past March, Slider took a turn for the best. The burgers were out of this world, The Dusty 45s rocked the Grand Hall, artist John Miller was at the top of his game, and there was fun stuff to do at the event, like get an up-do hairstyle or see how many friends you can get in one picture at the free photo booth. I was working the event, but still had a better time than most events I have attended. As the guest that I will be next year, I’m so excited for this event that I’m considering buying VIP tickets! If you have never checked out Slider Cook-Off, and you like burgers, beer, and rock ‘n’ roll, you need to get a ticket! Lino Tagliapietra, the Maestro of glassblowing. He is the greatest, and to this day, in his 80s, he is still the man on the floor shaping the glass, blowing the glass, and swinging the glass over his head. 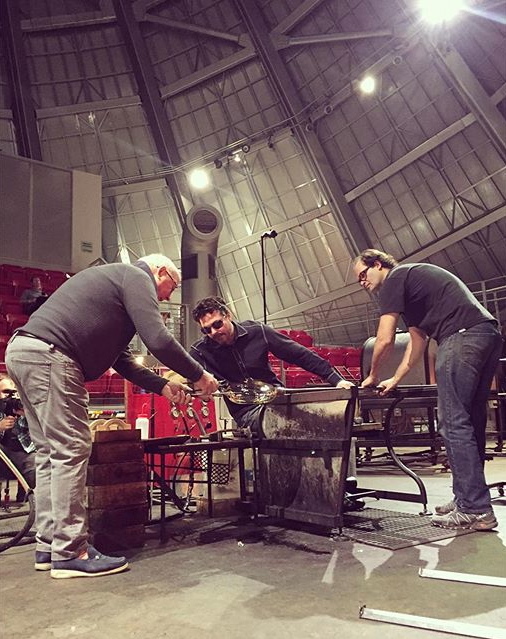 Lino Tagliapietra in the Museum of Glass Hot Shop; Photo by Russell Johnson. I have had the privilege of watching Lino multiple times over the past two years, and he blows me away every time he steps onto the Hot Shop floor. I have also talked with him personally and helped him here at the Museum, and from that experience I am happy to report that he is incredibly humble and views glassblowing as “just my job.” He is a special, special person and has given so much to the glass art form for over 70 years – he started blowing glass when he was 11! That alone blows my mind and demands respect. Long live the king of glass and I hope I get to watch him for many more years to come. When I joined the Museum two years ago, I had no knowledge of glass art. 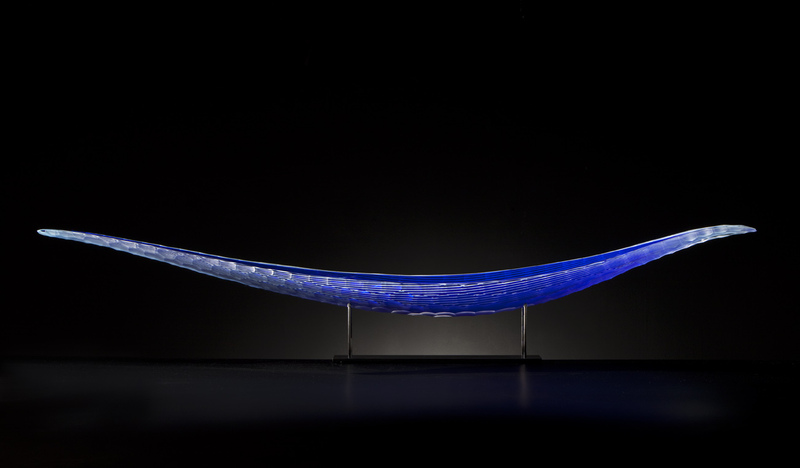 Since then, I’ve had the opportunity to really examine and create an opinion about glass art. I am not an expert to say the least, however, I do know what I like and what I don’t like. Two of my favorite artists came together in the Hot Shop this past February, and I have to admit I “geeked” out over these two. Maestro Lino Tagliapietra (left) and Erich Woll (right) assist Visiting Artist John Kiley (center). First, John Kiley. The spherical forms he makes, with chunks missing and two different color tones, really stand out to me as something from the future. And what can you pair with an emerging star? How about a living legend, the Maestro himself, Lino Tagliapietra. 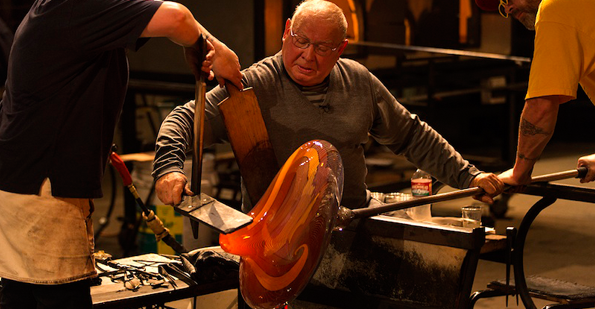 At a mere 81 years young, Lino is the Michael Jordan of glassblowing. He continues to create work year after year and does it with class and veteran savviness (I wrote about him in Moment 2, I know, cop out). This truly was a special week to be at the Museum, to see these two working together. Well there it is, everyone. The list. Honestly, the best thing about MOG is the people who work here. There is a wonderful team of passionate and creative people who make sure that this icon of Tacoma continues to educate the public about glass art. As someone who started working at the Museum with little knowledge of glass art, I feel pretty lucky to have had a two-year course in glass from some of the best people in the northwest. I urge you to keep coming down to MOG, and bring everyone you know! I want to thank everyone who I have had the pleasure of working with and I hope to keep in contact with this group for years to come. Thank you MOG. 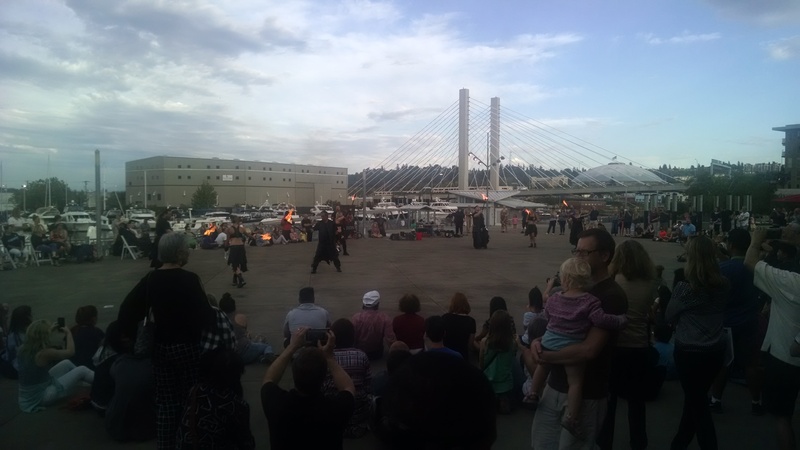 This entry was posted in Art, Artists, Events, Exhibitions, Glass, Museums and tagged glass art, glassblowing, Hot Shop, John Kiley, Lino Tagliapietra, Museum of Glass, Slider Cook-off, Tacoma on April 28, 2016 by Museum of Glass. This week, Museum of Glass took to Puget Sound television screens to discuss some of the Museum’s April exhibitions and events. On KING5’s New Day Northwest, Hot Shop Heroes Lead Instructor, Patricia Davidson, sat down with Sergeant First Class Peter Bazo to talk about Healing in Flames, which closes this month. Watch their segment and plan a visit to see the exhibition, on display through April 24. Also on television this week: Curator of Education and Community Engagement, Bonnie Wright. 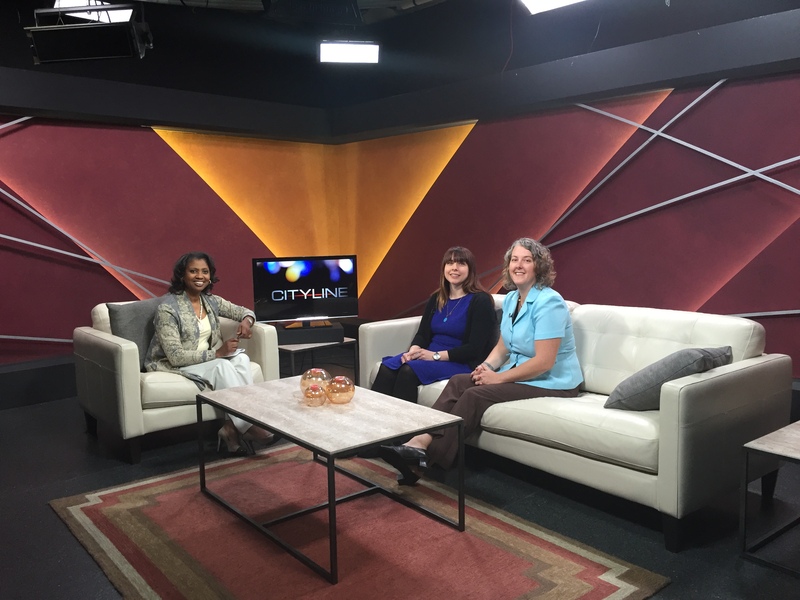 Bonnie joined Tahoma Audubon Executive Director, Krystal Kyer, on TV Tacoma’s CityLine morning show to discuss the upcoming Mirrored Murrelets event on Thursday, April 21. The two organizations are working together to offer visitor an opportunity to learn about art and birds at Museum of Glass during Third Thursday. From 6 to 7:30 pm, learn more about the art, science, and policy surrounding the plight of the marbled murrelet, a sea bird that nests in the forests of the Pacific Coast. Following the panel discussion, take a tour of Joey Kirkpatrick and Flora C. Mace: Every Soil Bears Not Everything, which features an entire gallery devoted to birds. Admission is free! Watch their CityLine segment here (beginning around the 45 minute mark). This entry was posted in Art, Events, Exhibitions, Glass, Museums and tagged Every Soil Bears Not Everything, Flora C. Mace, Healing in Flames, Hot Shop Heroes, Joey Kirkpatrick, KING5, Mirrored Murrelets, Museum of Glass, New Day Northwest, Tahoma Audubon on April 8, 2016 by Museum of Glass. 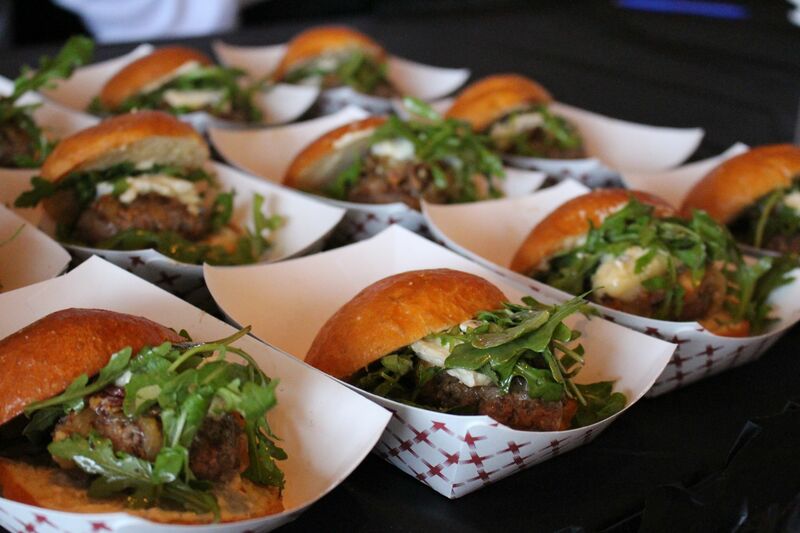 The fifth annual Slider Cook-Off is just around the corner! On March 26, seven Puget Sound restaurants will bring their slider A game to Museum of Glass to compete for the Judges’ Choice and People’s Choice awards. 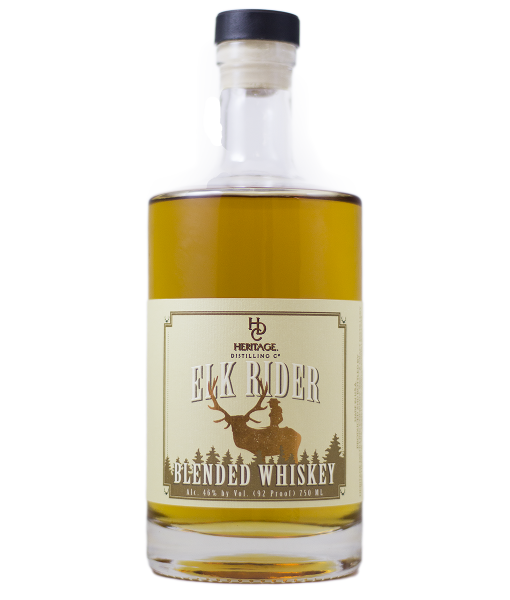 While each restaurant’s slider is top-secret until the evening of the cook-off, we can share what guests can sip on throughout the night, courtesy of Heritage Distilling Company. Which cocktail will you pair with your sliders? No matter what kind of slider each restaurant serves, Heritage Distilling Co.’s drink selection will help you create the perfect cocktail and slider pairing to sip and savor. Hope to see you at Slider Cook-Off! This entry was posted in Events, Museums and tagged Blue Suede Shoes, Classic G&T, Heritage Distilling Co., Jail House Rock, Museum of Glass, Pin Up Punch, Puget Sound, Rockin' Sour, Slider, Slider Cook-off on March 18, 2016 by Museum of Glass.